Easily convert your vinyl records or cassette tapes to CD in retro style with this Crosley Memory Master II Player and Recorder. Just insert a blank CD, play your LP or tape, hit "record," and get ready to listen to your converted music fresh from one of your car's six-CD changer slots. If you want to go the digital route, you can rip the music via USB to your PC or Mac with the included software suite. 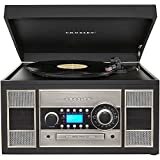 When you're finished converting your music, you can sit back, relax, and enjoy listening to your choice of vinyl, tape, CD or radio on this multi-functional player.